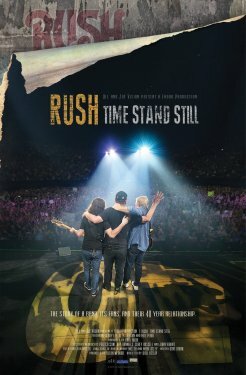 With their R40 tour completed, Canadian Progressive Rock icons Rush are bringing their tour to fans across the country with Rush – Time Stand Still, now playing in Cineplex theatres. Narrated by Paul Rudd, the unmissable concert documentary provides an intimate look into the band’s sold-out and possibly final tour, and the unique relationship Rush has with their devoted fans. One thing is for sure, Rush isn’t fading away silently. Amazing as ever, the doc features performances of “Tom Sawyer,” “Closer to the Heart” and more. The Band performs its last concert after 16 years on the road. Some numbers they do alone, some songs include guest artists from Ronnie Hawkins (their first boss, when they were the Hawks) to Bob Dylan (their last, when as his backup and as a solo group, they came into their own). The best moment features a performance of “The Weight” with the Staples Singers. What happened when The Rolling Stones hired The Hells Angels as security for their 1969 free concert at Altamont Speedway? Gimme Shelter provides a harrowing account of the Stones’ 1969 tour, with much of the focus on the tragic Altamont concert. This documentary takes a look into the history of the fabled recording studio where Fleetwood Mac, Nirvana, Neil Young, The Red Hot Chili Peppers and more recorded hit albums. Backup singers live in a world that lies just beyond the spotlight. Their voices bring harmony to the biggest bands in popular music, but we’ve had no idea who these singers are or what lives they lead, until now. The Oscar-winning doc features commentary from Mick Jagger, Bruce Springsteen and more. Directed by Martin Scorsese, this doc chronicles Bob Dylan’s strange evolution between 1961 and 1966: from folk singer to protest singer to voice of a generation to rock star. From director Ron Howard, Eight Days A Week features a compilation of found footage featuring music, interviews, and stories of The Beatles’ 250 concerts from 1963 to 1966. Get ready to shriek along with thousands of teenagers! Which essential concert docs would you add to this list?